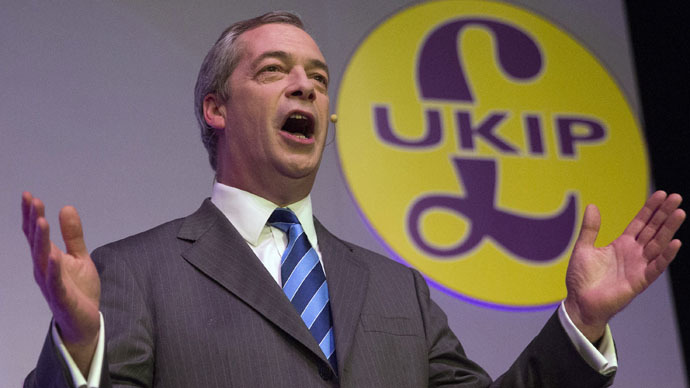 The UK Independence Party (UKIP) plans to ban unskilled immigrants from working in Britain, and launch a new watchdog to bring down net migration figures, party leader Nigel Farage announced on Wednesday. Speaking in central London, Farage called UKIP's policy "common sense," saying the electorate does not trust any other party on the matter, adding that 77 percent of the public wanted the UK to take greater control of the border. He pledged a "return to sanity", promising "sensible and controlled numbers" to turn "what has become a negative issue in our society, into a positive one." Farage added that the current immigration "crisis" was having an impact on schools, the National Health Service (NHS), and "changes in the community." The figures released last week show that net immigration stands at nearly 300,000, three times higher than Cameron’s original pledge to cap immigration at 100,000, a great embarrassment for the current government. Farage said he would not set out an “arbitrary” target ahead of the general election, but focus on giving highly skilled workers and “our Commonwealth friends” priority over unskilled immigrants. His suggestion of a moratorium on unskilled worker visas for five years and a points-based system, to "do as the Australians do," was met with rapturous applause at the church in central London where the speech took place. He further believes new arrivals should not have access to the NHS, therefore requiring private health insurance. UKIP spokesperson Steven Woolfe also spoke at the event. He said the party would abolish the rules which give EU citizens preference over non-EU citizens, adding that UKIP would provide an extra 2,500 border staff to implement new changes. Woolfe further controversially claimed that giving an amnesty to asylum seekers would support trafficking organisations which supply funds to terror organisations like Islamic State. On Tuesday night, Farage called the current system “unsustainable, unfair and unethical,” saying it gives preference to EU migrants over those from outside Europe. The party leader said caps are arbitrary, and the approach to reducing immigration should be more flexible. “In the end we can talk about numbers, we can talk about money, we can talk about the impact on wages ... but in the end there is something about this immigration debate which is about more than money. It's about communities, it's about the country in which we live,” he added.